Mark Johnston’s colt has already made himself one of the headline horses of the all-weather campaign, with five victories and one runner-up spot since switching from the turf after finishing third in a Pontefract maiden on debut in October. Matterhorn has gone up almost two stones in the ratings for his trouble, having proved unbeatable twice each at Lingfield and Chelmsford and once at Southwell. Only at Newcastle has he met with defeat, by one and a quarter lengths at the hands of Thaayer after trying to lead all the way in a novice race on the Tapeta. 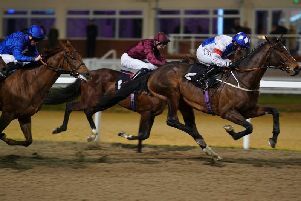 He heads for the first time to Kempton on the back of a convincing three-and-a-quarter-length win over a mile at Chelmsford - a performance which earned another 8lb rise but indicated this step back up to 10 furlongs may well bring further improvement. The opposition, in the opening race on a classy card, is suitably testing. Executive Force is another bidding for a five-timer - in receipt of 16lb from the top weight. But Michael Wigham’s gelding is a year older than Matterhorn, with plenty more mileage on the clock and therefore has significantly less potential for sustained progress. 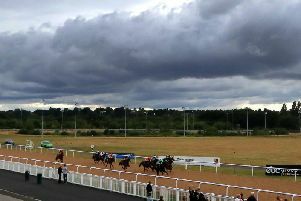 In division one of the Matchbook Casino Novice Stakes, debutant Ironclad faces two rivals who already have a win on the board each from their solitary attempts. Roma Bangkok and Moongazer must therefore concede upwards of 7lb and 2lb respectively to the rest of the 12-strong field - in which Ironclad stands out. His Khalid Abdullah colours ensure that, and preclude an inflated starting price too of course. There is more to recommend the colt, however, as a Dubawi half-brother to the owner’s Group winner Mirage Dancer. It will be no surprise to discover Hugo Palmer’s newcomer is well above average, and he can take advantage of a favourable draw in this mile contest. Half-an-hour later in division two, Don Jupp has the benefit of winning experience - having scored impressively on debut over course and distance last month. That means he must give weight all round, but he should be up to it. The ‘Road To The Kentucky Derby’ Conditions Stakes is a valuable feature race, in which Derby entry Jahbath is well-touted and by far the likeliest winner. William Haggas’ Hamdan Al Maktoum colt appeared to improve significantly from his turf debut at Salisbury in October, and has since followed that promising second with two wins here before Christmas and then a third in the new year at Southwell. Backed into long odds-on each time, he was especially impressive last time at seven furlongs - and he should appreciate this return to the course and distance over which he was previously successful. Four of his opponents also arrive on the back of a win - although in one instance, that was a walkover - while Chairmanoftheboard was eye-catching on debut at Goodwood before coming up short in a Newbury Group Three in the autumn. Jahbath nonetheless has the most compelling credentials. In the Matchbook VIP Handicap, In The Red may be able to go one better than last time - on his return to this course and distance. The six-year-old hung on well here in January, and was then not quite able to do so at Lingfield over a furlong further at the end of last week. Over jumps at Catterick, Tim Vaughan may have found another good opportunity for Debece to keep making up for lost time in the Injured Jockey’s Fund Novices’ Chase. The lightly-raced eight-year-old was a class above this level over hurdles and a convincing winner at Newcastle two months ago - so there is no reason why he should not follow up in this field. In the following Join Racing TV Now Mares’ Novices’ Hurdle, Emma Lamb is surely due a change of luck. Many things have gone wrong in her winless sequence, but there has been enough promise too to suggest she can break her duck in a race like this. CATTERICK: 2.20 Glimpse Of Gold, 2.50 Debece, 3.20 Emma Lamb, 3.50 Pull Together, 4.20 Let’s Get At It, 4.50 Wither Or Not, 5.20 Miss Heritage. DUNDALK: 5.15 Markhan, 5.45 Vhagar, 6.15 Spanish Soprano, 6.45 I Can Fly, 7.15 Western Australia, 7.45 Voyageofdiscovery, 8.15 Chaparral Dream. FONTWELL: 2.10 Bonne Question, 2.40 Kahdian, 3.10 Perfect Moment, 3.40 Sign Of War, 4.10 Molly Carew, 4.40 Lily The Pink. KEMPTON: 4.55 MATTERHORN (NAP), 5.30 Purple Paddy, 6.00 Ironclad, 6.30 Don Jupp, 7.00 Jahbath, 7.30 In The Red, 8.00 Kraka, 8.30 Maximum Power. LINGFIELD: 2.30 Brinkleys Katie, 3.00 Orobas, 3.30 Sea Of Marengo, 4.00 Footstepsintherain, 4.30 Haats Off, 5.00 Sixties Secret.